Tom Christopher Rives was born at Montgomery, Alabama, in 1892. He graduated from Alabama Polytechnic Institute with a bachelor of science degree in 1916, and the following year received a degree in electrical engineering from that school. During his years at college he served with the Alabama National Guard, enlisting as a private May 21, 1914. The following January he was commissioned a First Lieutenant in the Signal Corps of the Alabama National Guard. He was mustered into federal service in June 1916, and assigned to Montgomery, Ala. He later went on border duty at Nogales, Arizona, serving there until March 1917. He was promoted to captain in the Alabama National Guard in June 1917, and began his second tour of duty in federal service in October 1917, with the 106th Field Signal Battalion at Camp Wheeler, Georgia. A year later he sailed with his battalion for France to join the American Expeditionary Forces. Upon returning to the United States, he was honorably discharged at Camp Gordon, Georgia, August 14, 1919. On July 1, 1920, he was appointed a Captain in the Signal Corps of the Regular Army and assigned to Camp Alfred Vail (later renamed Monmouth), New Jersey, where he served with the 51st Signal Battalion. In July 1921, he became a student at the Signal School at that station and upon graduation the following June became an instructor at the school. In August 1926, he was detailed to the Sheffield Scientific School of Yale University at New Haven, Connecticut, where he received his master of science degree a year later. He then returned to Fort Monmouth, New Jersey, for a short period, after which he went to the Philippine Islands for service as signal officer of both the Philippine Division and Fort William McKinley. He was named assistant to the signal officer of the Philippine Department at Manila in October 1928. He returned to the United States in March 1930 for duty in the Aircraft Radio Laboratory, Experimental Engineering Section, at Wright Field, Ohio. In August 1936 he entered the Air Corps Tactical School at Maxwell Field, Ala., and upon graduation the following June entered the Army Industrial College of Washington, D.C. After completing the course in June 1938 he was appointed chief of the Radio Communications Section, Research and Development Division, of the Office of the Chief Signal Officer at Washington, D.C. He subsequently served as acting officer in charge of the Research and Development Division, and in July 1940, was placed in charge of the Aircraft Radio Laboratory in the Office of the Chief Signal Officer. He was named assistant to the chief of the Research and Development Division in August 1941 and several months later was designated director of that division. He became chief of the Engineering and Technical Division in the Office of the Air Communications Officer at AAF headquarters in July 1943, and three months later was named deputy air communications officer. In July 1945 he went to Wright Field as chief of the Radio and Radar Subdivision, later redesignated the Electronics Subdivision. 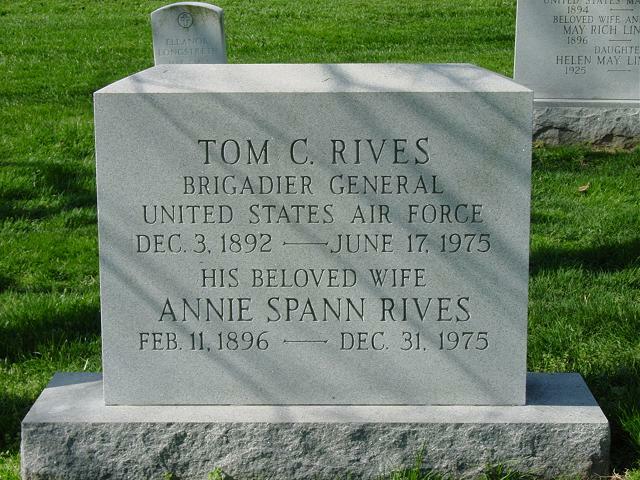 On October 5, 1945, he was transferred from the Signal Corps to the Air Corps. Rated an aircraft observer, General Rives has been awarded the Legion of Merit with oak leaf cluster.